Now you can receive a timely Group Digest that summarizes the new additions to your group and delivered to your email according to your preference. This is in addition to the RSS feeds support for group bookmarks and group forums, and email monitor for any particular forum thread that you are interested in following. 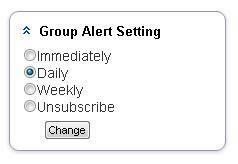 So depending on how you like info delivered to you, you can easily stay on top of your group activities.